San Diego employment attorney Corey Hanrahan is a litigation lawyer that fights against illegal employment practices. If you are looking for an employment law attorney, our firm is the one for you. Mr. Hanrahan is a lawyer with years of experience, and he is a member of the San Diego County Bar Association and Consumer Attorneys of San Diego. 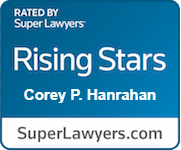 Mr. Hanrahan has been recognized as a Rising Star by Super Lawyers from 2016 to 2018. This recognition is reserved for less than 2.5% of attorneys in San Diego. Although there are rules in place, some employers take advantage of the people working for them, and we are here to protect your rights. The Hanrahan Firm handles cases involving violation of California’s Fair Employment and Housing Act, as well as those involving violations of wage and hour laws. We help employees who have been required to work off-the-clock, who have not received minimum wage, or who are being denied overtime compensation. We also assist employees who have been harassed, discriminated against, or wrongfully terminated in violation of California and federal law. As a top rated San Diego employment attorney, Corey Hanrahan will tell you that all workers have rights that protect them from wrongdoings from their employers, supervisors and co-workers. We help protect employees from these wrongdoings, and help seek compensation for the damages caused by unlawful employment practices. Mr. Hanrahan is a skilled litigation attorney here to assist you with your claim when the time comes. California is one of the few states to have enacted its own employment laws. The California Fair Employment and Housing Act (FEHA) and the California Labor Code protect employees from dishonest and deceitful employers. The Hanrahan Firm uses the protections of the FEHA and the Labor Code to hold employers financially responsible for unlawful treatment of its employees. We are your go-to attorney for all employment law disputes. We fight for employees who have been unlawfully terminated from their employment. We fight for employees who have been unlawfully discriminated against by their employer. We fight for employees who have been retaliated against for making protected complaints. We fight for employees who have been sexually harassed by supervisors and coworkers. We fight for employees who have not been paid legal compensation required by law. We fight for groups ("classes") of employees who are being subjected to the same illegal conduct. "Mr. Hanrahan is not only an excellent Attorney, he is also one of the nicest people I have ever met. He handled a matter for me with confidence, ease and displayed great strategic skills and perfect timing." "I was able to feel confident in my case and the person that was representing me thanks too the hard work and commutation Corey put forth. I am extremely satisfied with my outcome along with the person I was able to work with." "Corey is a top notch Attorney. I would recommend using him." "Attorney Hanrahan made it clear to me that we had an uphill battle, but that he was willing to fight for me. Attorney Hanrahan was knowledgeable, honest, and very responsive. Attorney Hanrahan was able to secure me a great settlement and the satisfaction of clearing my good name." "I truly believe Corey's first and main concern is his clients." "Mr. Hanrahan has made this experience extremely pleasant! I am exceedingly satisfied with his representation and communication... In my experience, he really cared about my satisfaction and went above and beyond! Highly recommended." © 2018 Hanrahan APC. All rights reserved. Terms & Conditions. Disclaimer.